Integrated infrastructure system (IIS) — Server, storage and network hardware integrated to provide shared compute infrastructure. Examples include VCE Vblock, HP ConvergedSystem and Lenovo Converged System (formerly PureFlex). Rigs of those three sorts collectively hauled US$8.7 billion through the door in 2014, up 30 per cent compared to 2013. 2014 sales represented “approximately 10% of all server, external controller-based storage and data center networking spend”, so this is a decent market. 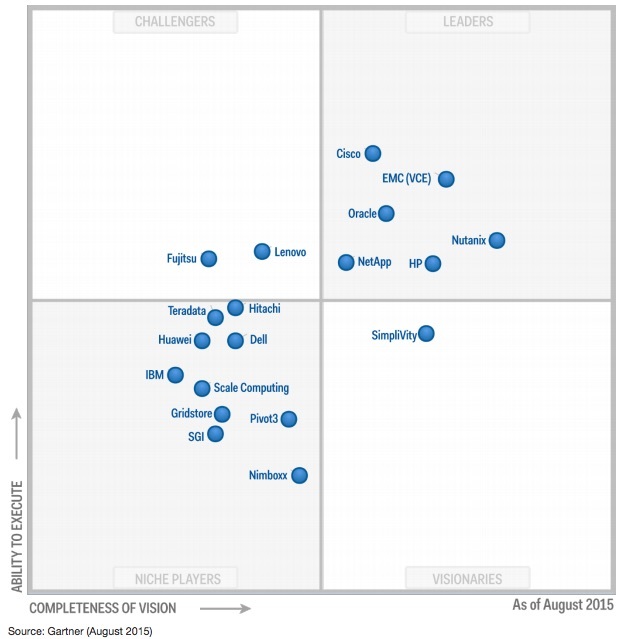 The big movers in this year's quadrant are Cisco, Nutanix and HP. The observation about Nutanix's growing influence is sound: the company yesterday announced a relationship with Citrix that will see the software company certify its XenApp, XenDesktop, NetScaler and ShareFile products to run on the infrastructure company's new Acropolis hypervisor. Citrix does the same for vSphere and Hyper-V, but also makes much of how well those products work when running on its own Xen Server. For Nutanix to score a gig with Acropolis signifies it's making waves. While we're on cannibalization, the magic quadrant describes the market for VMware's EVO: RAIL hyperconverged template as “nascent”. That doesn't stop the authors from praising NetApp for having adopted the platform, which they feel gives the company a great way to sell into large enterprises' remote offices so they can “share the same technology between their data centers and remote offices with all its attendant benefits.” FlexPods remain the main game and Gartner feels the product's wide acceptance and diverse channel all bode well. Oracle's place in the leaders' box because it has a broad range and is also finding success as its customers use its kit for multiple workloads. But Gartner thinks Oracle's preference for Oracle software on Oracle hardware is a problem because the analyst’s clients demonstrate “a continued fear of vendor lock-in of integrated software stacks, tied to hardware asset life cycles and varieties of licensing models”. When you play the game of storage arrays, you win or you – where are the visionaries?